Fit For Purpose - My Activewear Marathon! After the success of the sports bra the idea was to build a new activewear wardrobe but with my mum in hospital for over seven weeks now I have had little chance for sewing since it was finished. Along with all the research that has gone into this project I am quite exhausted. However, I finally got around to the first two items in my capsule wardrobe along with a number of other, wearable, test items along the way. Overall I am feeling rather pleased with myself. First up was to try Greenstyle’s Stride Athletic Tights, or leggings, as we would call them in the UK. I bought the pattern bundle which includes girls sizes and a shorts version. The PDF is layered which I really like when you have so many size options but, as with the Endurance, I did have some issues with the A4 version fitting together. I did work out that the problem was with the full length version only and did not impact on the capri length I had chosen to make. I again used some fabric bought by the weight from Abakhan and left out the pockets as this was just a size test. I was brave and I did go for the gusset version. There was no turning back once I had cut away the extra fabric. The instructions say to baste the two gusset pieces together but I used temporary adhesive spray as this fabric is just so slippery. You need to carefully mark the front as it is quite easy to get it the wrong way! I also put my waistband on back to front (inner waistband with elastic side facing out) but for the test version it was not a problem. The next day I took them to the gym (as wrong as the colour may be) and I did both a run and a training session. And yes they stayed up!!! So onto the real thing. The first issue was to find the right fabric. Melissa Fehr has a really good global list on her website and touches on this in her Bluprint class “Serging Activewear”. After scouring the internet I decided to use two of her suggestions, Fashion Formula for the prints and Funkifabrics for the plains. The bottom two prints are Active Lycra and the top is soft jersey. First point is that I hadn’t thought through the scale of the print. With Fashion Formula you can scale this yourself so next time I would actually go and measure out rather than judge on screen. Second, although less white show through than Spoonflower Sport Lycra, it is still a little see through for me when stretched. So I thought I would try some of the plain technical fabrics from Funkifabrics. I ordered the navy Meryl which I think is the same type of fabric as their plain black supplex (I ordered as a backup) but with slightly less weight and the same composition as my very favorite RTW. Then I added the Spider micro mesh, the navy being a new release. Then on to the way I would finish the seams. I wanted the look of the flatlock seams on RTW. Again after many hours on the internet and several practice seams later I got to where I was comfortable. My first thought was to produce a flatlock on my serger and then a three needle coverstitch on top. On the curve this didn’t seem to work too well and also my coverstitch skipped stitches. However, I did pick up a couple of useful machine feet on this first run. A centre guide for the coverstitch and a blind hem foot for the overlocker. The blind hem foot can be used to line up the edge of the fabric to keep it consistent. You also need to trim the seam allowances neatly if you use this technique and I didn’t think I was ready for this. Another way would be to overlock the seam with wrong sides together and then coverstitch the seam allowance in place to look like a flatlock stitch. Alternatively, I thought I would overlock the seam and then sew with the three needle coverstitch in reverse. Researching this I came across Johanna Lundström. After watching all her videos I bought her book, Master the Coverstitch Machine, which only came out a few weeks ago, and coverstitch needles for knit fabrics as well as Madeira Aeroflock. I was never sure of which brand of woolly nylon (although this brand is polyester) to use and I had certainly not see the needles before, luckily both were available from Barnyarns. More research on settings for a reverse coverstitch and I have not had not a skipped stitch since. The only issue remaining was to keep the stitching straight with the bulk and slipperiness of the fabric. My simple solution was to use a silk thread to baste in place and make sure the overlocked seam was to the right of my left needle mark. Back to actually making the leggings and this time I decided to put in both the side and hidden pocket. The side pocket is such a great feature especially as I am a tissue carrier and it is awkward to keep reaching into a zipped back pocket where I keep my locker key. I even matched the pattern. Once you have made the pocket the construction is the same. What I did find in my test version is that the layers slip around so for the first seam where the centre backs meet I stitched with my lightning stitch first to make sure both sides were an exact 3/8”. Then I overlocked the inner seam before attempting the reverse coverstitch on all four seams. I was amazed how good it looked. These seams are just so strong. Then the gusset is inserted. I watched the video which makes it look so easy and it is. Not sure what I was afraid of. You pin the gusset at the notch to the inner seam, making sure the gusset is the right way up, and then overlock starting just above the gusset. Once you get to the pin you tug the gusset around to continue to just after the end of the gusset. Then you do the other half of the seam starting at the centre front and continuing all the way around the other side of the gusset, folding the first seam allowance back and out of the way. Again I stitched the first part of the centre back to make sure the seams were matched. I then used a reverse coverstitch over the first side and then all along the second from centre front to centre back. I had to stop at the insert as there was just too much bulk to get through. Then the side seams are stitched together. I hadn’t thought this step through as I now had to reverse coverstitch through the completed legs. Not as bad as I thought. Just enough room to get to the bottom of the capri length version although not quite as neat as the other seams as I had to keep stopping to adjust the fabric tunnel. Only the waistband and hems to finish. The inner pocket was quick and easy. Although I should point out to make sure you put the pocket pieces to the correct ends of the inner and outer waistband so they match up! I prefer clear elastic to knit elastic and use a three step zigzag to secure in place. Once the waistband was inserted using the overlocker I secured the seam allowance with a chainstitch. I chose to place the hidden pocket on the front rather than the back. Then I checked the length before hemming as I like to wear mine just below the knee. I cut two inches off the bottom and used a three needle coverstitch to finish. The perfect legging pattern sorted I am still working on the perfect tank. I first tried the Greenstyle Xpres. I really liked the loose version I made to try out the size but I will make the tie back option next for use in the gym. Then I realised I have a tank variation on a Jalie pattern I already had - the racerback tank (3245). I made using some really inexpensive jersey which is not appropriate for activewear. It fits really well so I tried out my new glitter HTV from Happy Fabrics using a cricut access design. Really happy with the vinyl. Then I thought i would try another Jalie pattern, the Anne-Marie, so I could use some of the spider mesh on the side pieces. This is another versatile pattern offering both a tank and tunic version with built in bra and endless possibilities for playing with colour combinations. The tank is fitted with negative ease but I am really comfortable with Jalie sizing so went straight for it. As with many Jalie patterns there is a great video which I watched before even looking at the instructions although they did tie into the video. The pattern is a layered PDF and went together perfectly. I used the Active Lycra for the main panels, the Spider for the upper side panels, the Meryl for the bottom side panels and strong powernet for the bra. It went together like a dream. I mostly used the overlocker for the seams but for the curved front and back neckline I used a lightning stitch to keep the bulk down. I did the reverse coverstitch on the centre front and back panels as with the leggings. A little fiddly to sew but the video is very clear and I really like the idea of no binding around the neck or armholes. 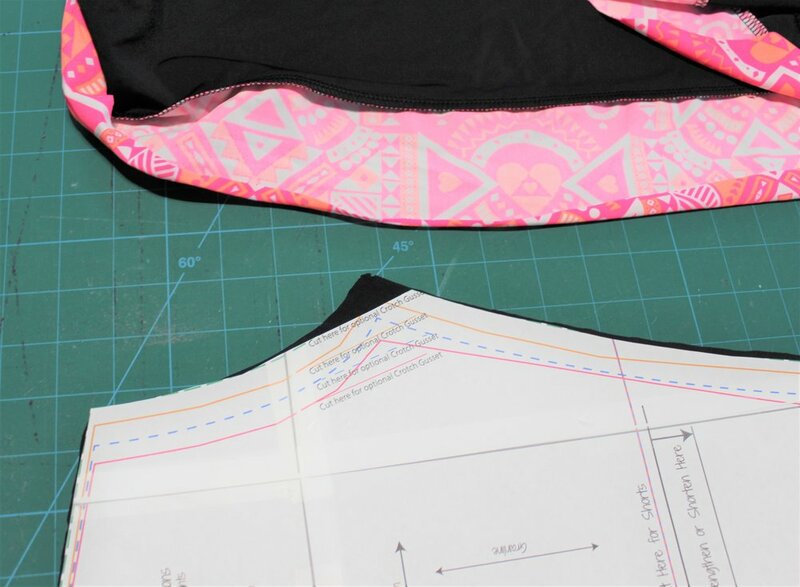 There is elastic inserted around the upper back from one princess seam to the other so it stays in place. As I have used strong powernet I could use this without a sports bra for most activities. It fits so well and the finish is so neat and tidy. So next up is another Endurance but with all the gym work I now have to make a different size! I also want to make some mix and match items including the Greenstyle Solo tank. However, first I am departing from knits and hoping to make a Til the Sun Down vintage look dress for a special occasion.